Dash assemblies come in wood burled (pictured), granite burled, carbon fiber, turned titanium & black. We also have kits which include matching steering wheels & arm rest covers, chrome column covers, chrome pedal pads, chrome forward/reverse levers and matching drink holder covers. Prices are from $129.00 to $499.00. Utility boxes come in diamond plate, as shown, black powder coated steel and lightweight polyethylene. The boxes can be purchased seperately or with a dump type mounting kit or stationary. 2000 & older Club Cars require rear struts which secure the top. Utility boxes are priced from $219.00 to $599.00. Our light kits have head & tail lights only or kits can include brake lights, turn signals, horns and voltage reducers which are needed for 48 volt electric carts. All include wiring harnesses and instructions. Light kits are priced from our basic kit at $119.00 to our premium kits at $589.00. Replacing a motor in a golf cart requires knowledge and experience to get the results you are looking for. Motor replacement can add speed or torque. High performance motors usually require a controller upgrade, but not always. Give us a call and we can get you set up properly. If it is a standard forward/reverse switch or heavy duty for a high performance cart, we have what you need. Priced from $65.00, we have forward/reverse switches for every make and model golf cart. We will make sure you get the right part. You never know when a cold drink is just the thing you need. Our coolers can mount just about anywhere on your cart you would like. The newest column mount is shown here. We handle 6 & 12 pack coolers which mount front or rear, column or fender. Coolers start at $35.00. Mouning brackets are extra. We also have a variety of mirrors. This 5 panel mirror is the most popular but we also handle a 5" round mirror, a sports mirror and side mounted adjustable rear view mirrors. Mirrors range from $12.95 to $49.95. Shown here is a one piece fold down tinted windshield. Look a little closer and you will see our wind dam up by the top. This blocks the wind on those cold days. The windshields come in clear or tinted, solid or fold down. We also have high impact, street legal windshields. We carry motorized or manual windshield wipers for solid windshields to help make your cart street legal. Wind dams are priced at $35.00. 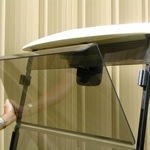 Clear or tinted fold down windshields start at $119.00. We have enclosures!!! Everything from white vinyl to classy sunbrella enclosures. Zipper front or velcro. Club protectors, matching seat covers or just plain zippered rear curtain. Over the roof or track style. Snap down sides or hook on the bottom of the cart. Vinyl, over-the-top comes in white/beige/cream, or for a little more there are 6 more colors to choose from. Speed or torque controllers, programmable or non-programmable, from a stock 225 amp to 600 plus amps. We can provide a new or rebuilt controller, whatever fits your budget. We carry a large variety of bushings, bearings, gaskets, brakes, cables, fans, switches, tires, wheels, floor mats, body parts and any other parts related to a golf cart that you could possibly need or want. If we don't have it we will do our very best to find it.